(April 2014) Lead therapist Michael Firestone adjusts the Exoskeleton computer backpack for veteran Josh Baker, paralyzed after a motorcycle accident. Tampa’s James A. Haley VA Hospital is using cutting edge technology to help injured veterans rehabilitate. One of the devices, at the Spinal Cord Injury Center, helping paralyzed veterans stand and walk again is the Exoskeleton. 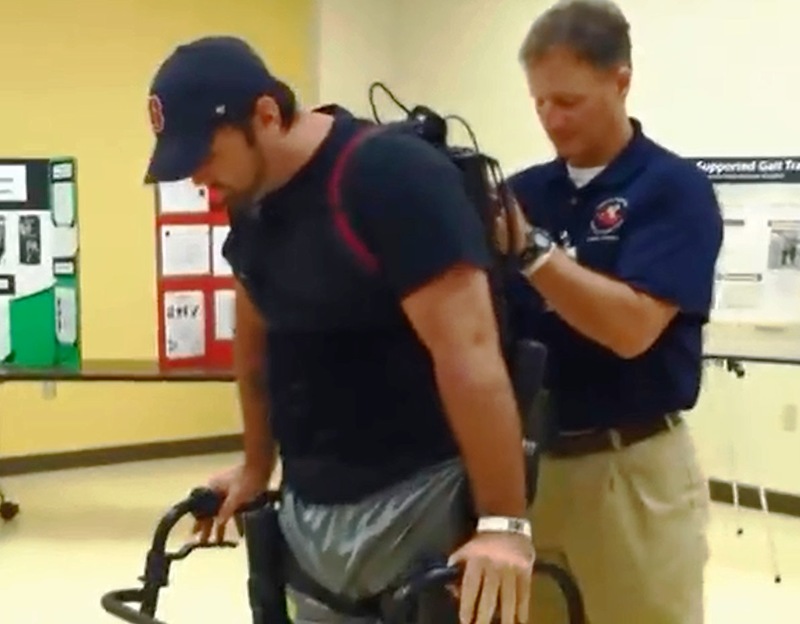 Using a computer backpack, robotic leg braces and a walker, veteran Josh Baker demonstrated the Exoskeleton during the April 2014 ceremonial opening of Haley’s new Polytrauma Center. Baker said it didn’t require much effort on his part. “If you get a good rhythm and you’re good upright, you can actually walk right along and the machine simulates it,” Baker said. His VA therapists were impressed by how quickly Baker advanced after just two weeks of practice. Baker was on the device’s most advanced setting, where the device takes automatic steps once it senses the veteran’s foot is in the correct position. 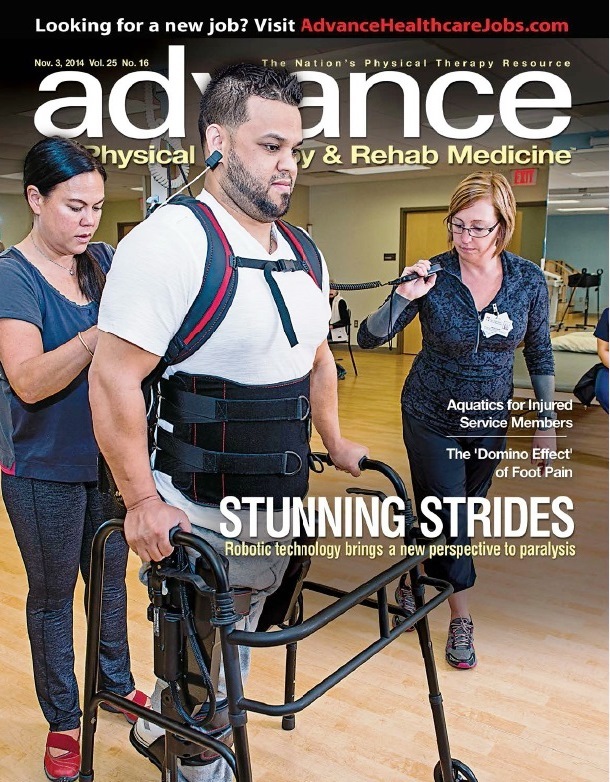 One of the features of the Exoskeleton is that it can be programmed with each individual’s weight, height and gait which individualizes the simulated walking, therapists said. Witnessing their wheelchair-bound son walk again that day at Haley was emotional for his parents Laurie and Robert Baker. Laurie Baker said anything that makes her son feel better makes her feel better. His father agreed. He said the device also will help other veterans living with disabilities. Haley is one of two Ekso Bionic Centers in Florida. The other is located at the University of Miami Project.